Perhaps the best way to look into a man’s soul is through the eyes of his wife. For Fields Pianos founder, Harry Goldman, his wife Rita is the one who shed light on his drive, passion, soul and dedication to building and sustaining this family business. 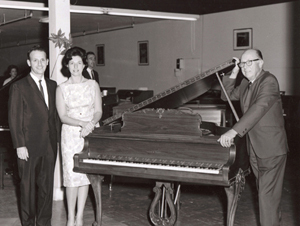 When talking about his decision to get into the business in the 1950s, she said, “Harry took to it like a duck to water – he really loved the piano business.” Upon first meeting Harry’s three sons, Gary, Irwin, and Jerry (oldest to youngest), one might get the impression that they simply inherited the magnificent piano showroom in Orange County. Their rich inventory of southern California’s finest pianos accurately displays the passion and appreciation one would expect from an exclusive authorized Steinway and Sons dealer. But what it fails to convey are the values of apprenticeship and integrity that Harry instilled in his sons. Through them, his legacy lives on and continues to grow. The history of Fields Pianos is not just about the excellence of a product and a shrewd businessman. Rather, it is characterized by great risk, hard work, and determination. The Fields Pianos family business originated in the Windy City in 1947. Harry’s older brothers, Dave and Max, were in the furniture business buying and selling new and used furniture. During negotiations for an acquisition of all the furniture in a house on Lake Shore Drive, the seller added, “I also have a piano if you’d like to try and sell it.” After much consideration, they accepted his offer and gave it a try. Not long after that, a pastor from the south side came into the furniture store and purchased the piano for his church. Noticing that the piano sold quickly, the Goldman brothers wanted to explore their options and thus, in 1947, Dave and Max Goldman entered the piano business. In Chicago at the time, Marshall Fields was the premiere clothier, and when Chicagoans were going shopping they would typically say, “We’re going to Fields,” abbreviating the store’s name. The Goldman brothers wanted to communicate to the marketplace that they were the place to buy fine pianos, so they took on the name “Fields Pianos,” hoping to become a similar household name. In 1953, Harry’s brothers sent him out West to run a wholesale operation selling grand pianos in 11 states on the other side of the Mississippi. It was sales the hard way with a lot of driving, and Harry began to have his doubts. Uncertain about the location and anxious to settle down, Harry called his brothers in Chicago, forcing the issue with the question, “So are we going to be in southern California or not?” Dave and Max agreed it was the market they needed to break into, so Harry began selling new, used, and rebuilt Steinways, Wurlitzers and Kohler and Campbell grand pianos throughout the region. Finally, by 1958 he had become well-known enough and graduated to selling wholesale “off the floor.” One year later, his brothers made him a full partner. 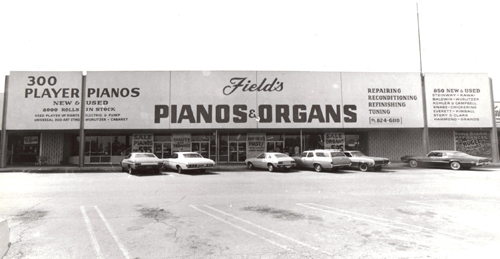 The first location of Fields Pianos was on the corner of Beverly and Vermont in Los Angeles. After a few years of success there, Harry bought out his brothers in 1962 and decided to become a retail merchant. The wholesale business was proving more difficult due to the influx of new brands of inexpensive Asian pianos, so retail seemed to be the next natural step. He adjusted to the market changes by placing extreme emphasis on service and providing the very highest quality instruments in a variety of price ranges. The second generation of Goldmans first became active in the business when the oldest of the three brothers, then 18-year-old Gary, began to learn about the inner workings of the piano from a master technician from Argentina. Gary was in dental school at Fullerton when he “felt the pull” of the family business and decided to follow in his father’s footsteps instead of pursuing dentistry. Harry would joke with Gary as he learned to rebuild pianos that he was “pulling old pins instead of teeth.” In 1971, Harry’s second-born son Irwin grew interested in the business and began the apprenticeship process. One day, Irwin was caught writing the words “H. Fields and Son,” on the back door of the building, daydreaming of eventually being the sole heir to the operation. He, like his father, had grand dreams and aspirations. Sure enough, in 1974, Harry’s youngest son Jerry tried his hand at the piano store. He figured since his brothers liked it so well, he should try it before pursuing a profession in education. He discovered the same passion for the music business as his brothers and he became the final component of the future business ownership structure. With time, it became apparent to Harry and Rita that the three boys were going to make a career in the piano business, so he trained them in all facets of the operation. Harry’s recollection of father-and-son businesses he had sold to in the West (during his days of wholesale) made him leery of holding on too long, having seen first-hand the friction it could cause. So, in 1979, despite the advice of many, he stepped aside and sold one-third ownership to each of his three sons. Relinquishing control and giving them autonomy to take the business to the next level proved to be a wise decision. Today, Fields Pianos passionately maintains its commitment to honesty, integrity, and service. For nearly two decades, Fields has proudly carried the banner “Home of Steinway” here in southern California. Their showroom, located at 810 E. Dyer Road in Santa Ana, California, displays the family of Steinway pianos, which includes the prestigious American handmade Steinway and Sons piano, as well as the Steinway-Designed Boston and Essex piano lines. 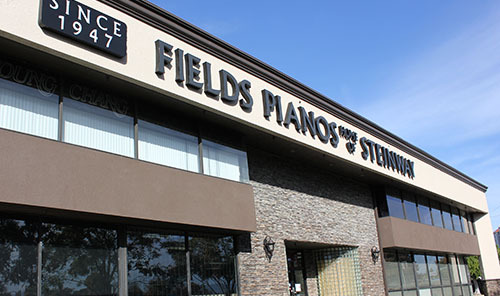 Fields Pianos continues to be the family-owned and operated company customers can depend on. The future is bright for Fields Pianos and the Goldman family is happy to continue to be a pillar in the Orange County community. Fields Pianos is fortunate to have some of the most experienced and knowledgeable salespeople in the country. Our sales staff represents many decades of music performance, teaching, and product knowledge, and we work as a team to assist our clients in choosing the best possible instrument for their family. In addition, our dedicated office support staff assist with all service, warranty, and trade-in needs to insure the utmost customer satisfaction and care during and following the purchase. We hope to see you soon and look forward to you joining our Fields Family!